Nanette is a girl after my own heart, or should I say a frogette after my own heart. Plus, Mo Willems uses a technique called homoioteleuton also known as “near rhyme”. The technique was first identified by Aristotle in his ancient Greek treatise on the art of persuasion, called Rhetoric. Not interesting enough? The book is funny and I had to add my voice to any positive buzz out there about this book. 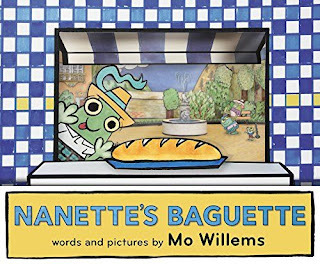 Nanette is a young frog who is sent, for the first time, on an errand to purchase a baguette presumably for her family’s dinner. 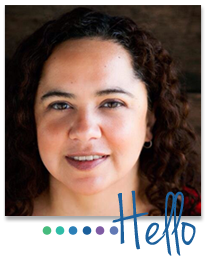 It is the first time she has been entrusted with such a big responsibility. She wants to do a good job. She is briefly distracted by her neighbor’s pet, but quickly re-focuses her attention on her primary mission. Nanette arrives at the bakery. Baker Juliette, knowing that it is Nanette’s first time to be sent on such an important errand, gives her the best baguette she has. You will have to read the book to find out what happens, but I’ll give you a hint, she does exactly what I would do with a yummy, soft, warm baguette and a long walk home. 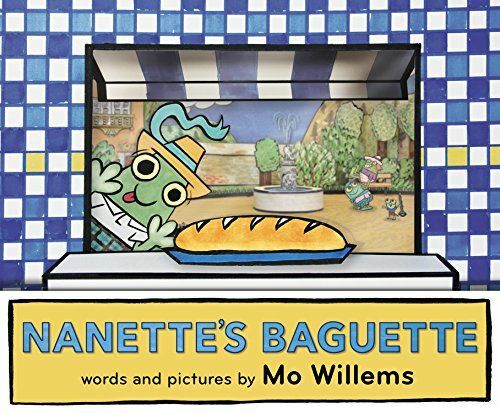 If Nanette’s Baguette, a picture book written and illustrated by Mo Willems, has a lesson, it’s that baguettes are yummy and a frog is only human. The humor of the story revolves around our own weaknesses in the face of temptation. The story, however, doesn’t need a lesson. It just makes you laugh. If that weren’t enough, the jacket of the book delineates just how the illustrations were actually a combination of cardboard constructions and drawings. Pretty cool, I think. See the video below. My students loved the story. They laughed out loud and they kept insisting that Nanette was French, a conclusion I felt was quite astute for second grade Spanish speaking English language learners!